EDIT: THIS IS MARK II INFORMATION. It's entirely possible that you already know that, given the dates, but even if this popped up on your google search while you looked for Grim2, again, be well aware that this is an edition change away. While Grim2 did not change much into MK3, the rest of trolls did, so take that into account when you read this article. Do I plan to update this article? Not whatsoever. 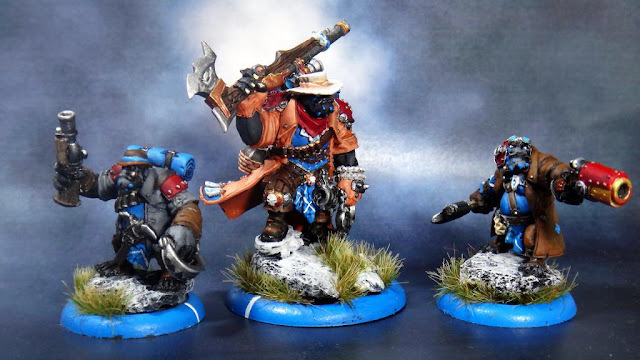 As far as I'm concerned, PrivateerPress has thrown their game out the window and has no interest in a competitively tight ruleset, and has repeatedly demonstrated that attitude. There will be no more PP related batreps or strategy articles on this blog until that changes. I'll be playing something else. Hunters Grim, or Grim2. The second incarnation of Troll's favorite Anti-Cryx caster. There's really no in-between with him. Either you love him and his playstyle, or you wish you had Grim1. I'm in the first camp. Every time I play Grim1, I wish I had Grim2. Grim1 does some things much better, and probably has the best control feat in trolls that's an actual control feat, not "You can't actually hurt me, so don't come here.". Some of Grim2's problem when he first came out though was that Trolls really didn't have a lot of things he wanted. Burrowers and the Bomber was an auto include, but Scattergunners were really the only other major ranged unit that got any benefit from his feat, and even then, the snipe really only was for Grim and his cohorts. He didn't make Bushwhackers or Sluggers much more competitive, and he really slid off to the side again til probably the last year and a half. When I began picking him up, I was getting drug all over the place by Cryx and needed a solution. My problem with Grim1 is that he's very very good at two things, and has a control feat, and he can deal with stealth things very easily, and he can lower DEF like nobody's business. The problem I had is that A) He had to get up the board to do it, and thus risk himself though the feat helped, and B) Any ARM skew whatsoever and Grim1 is in trouble. I have seen lots of Grim1 builds that had Mulg in it, which makes sense, but since most of the time I'm running my pairing with one of the Doomshapers, Mulg is usually taken with one of them. So, in developing this Grim2 list, let's talk about what we're covering in the list pairing. Until last December, I had Runes. Runes is pretty well known, does a lot of things well. If it wasn't Runes, it was a form of Meat Mountain, but usually Runes. Runes murders most Hordes armies, is very good against shooty Warmachine armies, and has a great tankiness to it that makes it very difficult to root out of the zone. What it does not like, however, is better control presence, lots and lots of infantry, and weaponmasters specifically. So, Cryx basically, though Runes has enough AOEs to try and make it work, but I still found myself getting swarmed and losing key pieces easily to three or four small based models. Menoth is hit or miss. Cygnar is hit or miss. Also, the mirror matchup was an issue unless it was just Runes on Runes which is horrible. Menoth's biggest deal for me was weaponmaster spam. None of that, then we were fine, but otherwise it was a Cryx problem kinda thing. Haley2 also concerned me a lot because of how trivially she controls Mulg. Time Bomb, Dead-eyed ATGM and feat. My favorite things are simply going to get pushed around the table and frustrate me. In December, Doomshaper3 dropped, and my tastes have changed a bit. Time Bomb from Haley still hurts, weaponmaster still hurts, but Mulg doesn't get knocked down anymore, or pushed around. Druids can't pull my stuff around anymore. I run the Mountain King and I can remove support all day. All sorts of things. Doomshaper3 is my guy. The Harby matchup is now an issue though because in our meta, Paladins are a thing, and Harby Tier takes like 5 of them. So Mulg and D3 are the only models that can deal with it. It's a playable game, but I don't feel like I have the volume of attacks to kill Paladins under Martyrdom. Enter the Hunters Grim. Grim2 solves a lot of these issues. Whereas Grim1's game gets flipped if there's armor involved, Grim2 can debuff it just fine. Grim1 has to get way up the zone to do things, but Grim2 can hang back, make sure his stuff is in control, and then reform on top of that to a safer spot. Secondly, the little trapper thing is pretty legit too. As long as it's not a super high-ARM beast, or a warjack in general, Grim should be ok. As far as warjacks go, there's not many that can get through Grim's DEF16 on 3 focus without some serious help. Grim2 definitely stays within the Trollblood bounds of "Difficult to assassinate." Secondly, Grim2 gets snipe out faction wide and turns the ranged game up quite a bit. +4RAT is very common in Grim2 lists, and +6 RAT is entirely possible. RAT10 POW16 burrowers are crazy, man. What makes him even more playable now though, you ask. Well, let's look at them. Highwaymen. Highwaymen are hit or miss for a lot of players. Strictly playstyle preferences. Without any help whatsoever, they are 20 RAT5 POW10 shots. However, I think that's the wrong way to look at them. They're actually 10 RAT7 POW12 shots, and that's extremely legit. They threaten 14, but any caster with movement buffs or range extension helps them with that. Grim2, I feel, is the best caster for them. Gunnbjorn likes them too with Snipe, but that's it. They're good with him, but Grim2 I find only needs snipe on them once and after that it's not an issue. Between Mirage and Snipe, they can threaten 20''. That's not bad at all. Stack Mortality on them and now we have 20 RAT9 POW12 shots under feat. CRA? Ok. 10 RAT11 POW14 shots. There's not many casters that survive that. Grim2's feat turn is usually turn two, maybe top of three. At that point, I have a decision. If they've made any mistake, I kill their caster. If they've made no mistake, I might still kill their caster. If the caster is straight up unkillable (Read: Hordes and lots of transfers. I've killed Butcher3 and Denny3 both), then I kill everything else. If Denny1 has hid way outside of my range, I kill all of her infantry. I leave her with nothing. Highwaymen adapt to that very easily with CRA. I could choose to do 4 POW17s even with them, but if there's a lot of infantry on the table, 20 POW12s do a lot to remove it. Grim2 loves these guys and they love him. There's only a handful of casters that run her with the HWM, IMO. Grim2 can be one of them. Grissel2 and Calandra are the others because of how they can enable the backstrike bonus. In Grim2's case, it's Mirage. The Highwaymen can be placed behind things they're engaged with, or outside of melee and walk around. However, she doesn't play into my gameplan with Grim2 very well because I usually feat going in, and that makes or breaks the game most times. She's also 3pts of support in an already support intensive build. One day, I want an Ocean's 11 list with Grim2 or Calandra, and she'd make that. These guys are my current favorite addition. Most of my Grim2 list has models from the last year and a half, and the Knot is no exception. Grim2's major lynchpin in my opinion is Mortality. Mortality is Cost 3 and boosted. It's essentially Cost 4, and if you miss, you're done. You've done nothing for your army ARM wise, they're down 2 RAT, and you're on 1 transfer because you upkept Mirage. I've missed so many boosted 8s with Grim2 it's not even funny. The Knot fixes a lot of that. And for two more puppet masters, I can get one onto the Bomber and help him out, feel better about not boosting to hit on one of those attack rolls, and the other puppet master goes to the HWM or Rok, maybe get that crit freeze on the assault. In fact, the odds of that crit freeze landing go up quite a bit. A lot of players look at the odds of an assassination and move on. They only consider it if the chips are down. Even then, the odds are long and they might be able to pull an attrition swing. The Dhunia Knot does a lot to skew those odds in your favor. My specific Grim2 list has a lot of the tools in place (I can't wait for him to be back on ADR) that enable so many assassinations, but those tools can easily make or break the rube goldberg machine that has to go down perfectly in order for it all to happen. The Dhunia Knot makes those far more reliable with Puppet Master on 3 different models. I faced down a double Judicator Durst list with Grim2, and won. When I needed to remove any piece in the list, I can get a a rerollable boosted Mortality from Grim2, followed by a rerollable boosted (L&E) quake shot from Hutchuck or Krump, stacked with 3 POW16 shots off of a Glacier King who can either A) Reroll those snakeeyes to hit, or B) grab that die that rolled a 1 in a boosted damage roll that actually got a total of 11, and maybe get a four or a five now. The odds of your army pulling through on assassination runs that rely on key components are incredible now, thanks to this unit. The runebearer was in this list for a long time, trying to get Mortality down to a Cost 2. Lynus and Edrea are a better answer to that I believe. Something Grim2 lost when he upgraded incarnations was that he handed the knockdown gun off to a pyg that couldn't boost it. Lynus helps with that quite a bit. He can put it on the Pyg, he can put it on Grim2 and make Mortality cost 3 w/ boost, he can put it on Hutchuck for that boosted Rust, you name it. Very adaptable model. Again, helps the non-warcaster parts of the puzzle put their weight in reliably. I remember playing Cygnar, and how many times the game came down to whether or not Eiryss2 landed that focus stripping shot or not. No more. She'll be boosted from hereon out guys. Also brand new, Hutchuck brings Rust to the game. Speaking of the same game, with Hutchuck against double Judicator on Durst. Between Mortality and Rust, I removed the Colossal from the game trivially. Grim2 is basically my Warmachine drop against non-super shooty lists, and Hutchuck is great for that. Quake is also a nice addition, and I like having more than one in the list. Sometimes Grim2's pyg doesn't get there. I'm not a super Glacier King user yet. I think he's good, I think he does a lot for trolls, but I still prefer other things. On Grim2 though, he's very good if you can manage his fury (Swamp Gobber Chef). He brings a degree of Board Control that Grim2 didn't have before, and he tries to anchor the game for you a bit too in the end game. He buffs Grim's DEF great as well, and does the same for the HWM. He'd seem like a shoe-in, but when he came out, Denny3 was super popular in my meta and the Glacier King straight up couldn't hit her, KD her, or anything. I went back to Bomber/Rok, and have continued to be very happy with that battlegroup. I know he's not a new option but I rarely see him, much less on Grim2 and he deserves an honorable mention. I don't play Rok through most of the game, but it's fairly common that he's able to help clear jam units out of the way on feat turn with the spray, or sometimes land the crit stationary on the caster (thanks Dhunia's Knot), but if the assassination goes downhill or we turn to the attrition game, Rok is an amazing endgame piece. Mirage to disengage or get him further up the board, a free charge, Mortality + Primal? He's easily the biggest bully on the board in the endgame. Especially if everything went well on the feat turn. Sure, Mulg maaaaay be better, or maybe a second Bomber. Generally though, I hit a game where there's a crazy hard target that I really struggle to shoot off the board (A colossal usually), and Rok threatens it enough that it has to stay back. It can't come wreak havoc or apply scenario pressure because Rok will end it. And if things really get pear shaped, my Bomber gets primal and now he's a very capable heavy too. Rok goes in all of my pairings, and usually on Grim2. It's hard to pass up. These guys are in everyone's lists right now. They're amazing, and under Grim2 they're no different. They are great for Mark Target, they're fantastic for attrition games, they love mortality, they're just good all around. They're currently not in my Grim2 list, oddly enough, but I find they don't contribute too much to the overall assassination plan. They're almost strictly an attrition tool. A really good one, but attrition. It's not often a 6'' spray will reach back and touch the caster. Still very good, still worth considering in your list. There's a few playstyles for Grim2, and the plethora of new solos and units help to really define what you can do. I think Grim2 can play a very strong attrition list, or a very strong assassination list. My particular variant currently is a very strong assassination with a decent attrition game. Last week it got put to the test against a full-camp Butcher2 with Gorman's cloud on him. He was DEF16, ARM25. Even with Mortality, the Burrowers were dice -9. In that particular situation, I would have preferred to go attrition, and wait til Butcher rolls lower Fury or spends some of it but my opponent had successfully placed me in some strong scenario pressure so I went for it and pushed the Dhunia Knot to the limits. Killed Butcher with 3 Dygmy rolls to go. I've seen Grim2 lists with Blitzer spam anchored by Dozer's Veteran leader. I've seen lists with tons of melee infantry that just want Mortality, and the feat just kind of works for him, maybe the scats. I've seen some minon heavy lists, and I've see some other goofy stuff too. It really comes to your playstyle. Right now, I want Grim2 to be fast games, turn 2 or 3, shoot the caster and pack the tray. I'm not even counting on mistakes. You can play your caster very safe, and I'm ok with that, I'll kill everything else. Eventually though, unless you just feed me your whole army, the caster has to come out and play and at SPD6, RNG17 w/ Snipe, there's not many places where I can't start pinging you. It's really simple. Fenns usually get mirage unless I feel like the caster is going to play it safe and hide. Then the HWM get mirage. If the Fenns get it, they run way up and stagger so that hopefully only the front two or three get nailed. Between Vengeance and Mirage, it's a 5'' non-linear movement that can clear some chaff. Burrowers usually burrow turn 1. Definitely if I'm going second. Turn 2 is when I like to feat. If there isn't much blocking LOS to the caster (a Warjack is actually best case scenario), if he's not camping a huge ton of Focus and is high ARM to begin with, and if he's not got any tricks that backfire on me, I'll go for it. Warlocks are a bit scarier. I do have the volume of attacks to do it though. If a list could assassinate the Legion Twins, I think it'd be this list. So, if he's hiding behind a jack, Mirage gets upkept, Burrowers come up, Vengeance triggers, Fenns do some stuff and then we negotiate Order of Activation. Ideally, the Fenns/Fell Caller can remove what's in the way, be it a screening unit, a shieldguard, whatever. The goal is for the Burrowers to activate after Grim and get the feat bonus. Sometimes they can't, and they just have to go up and try to clear it themselves. Dhunia's Knot will go on all the important pieces at the beginning of all this, and then we'll go from there. Ideally, Grim2 goes before the burrowers and feats, lands Mortality and shoots the guy once. Krump KDs the jack in the way if he needs to before Grim goes, but otherwise, KDs the caster hopefully. Then everything else goes. Bomber, Rok, Burrowers, HWM. It's very rare that a caster survives all of that. The HWM are actually some of the more key pieces in the last. With mortality, they land a pair of POW22s on the caster and finish off a lot of things. Fenns don't seem like they do a lot in the list, but if all they do is keep people from shooting my Highwaymen, I'm a happy camper. If I can't touch the caster, then I may or may not feat. Either way, Grim2 goes early, gets Mortality on the best thing and reforms. Fenns tangle up in the lines, and HWM/Burrowers remove infantry from the board as much as possible. The list seems to attrition very well, and I really think a lot of it is the high volume of reliable attacks that HWM can land on mortalitied targets. The other thing is the Witch Doc Croc. Haven't talked about him a lot. He's legit. He's there for Awe, and fearless Burrowers. He's been very key in a lot of matchups, and since we have a Harby issue in our meta, I don't see him going anywhere. Possible things I may change in the list. The Fell Caller might go away. The only thing that reeeaaaally needs Pathfinder are the Fenns and they get it on the turn it matters anyways. I also really like the +2 to hit, but the Fenns hitting things isn't crucial to the list. It's very nice, mind you, but it's not make or break and if it is I have the Knot for that. 3pts to something else would be nicer, I think, and in this case, probably Lynus and Edrea. Hutchuck is a fantastic consideration, and I'm very tempted because Rust + Mortality is crazy. But having a free Mortality boost, or a boosted KD shot, or so many other things is really tempting. Also, Edrea gives me another magic attack which can be nice as well. Everything else in the list performs very well, and has time and again done well. I'm pretty confident into most Warmachine matchups that I can at least make a game of it with Grim2. I tried him with the GK for a bit, but I had a really difficult time anchoring the late game with him at MAT5 and Denny3 was very big in the meta at that point. I could probably get away with it now, but the biggest thing that helps is the gobber chef. Before, the GK wanted to run full, and Grim2 wanted to camp a few, and the GK can't pass frenzy checks pretty much ever. So that was out. With the chef, I might could make it work now, and it'd give me a few more points to play with. I'd still have to camp 2 all the time or cut for fury but it'd be doable at that point. Idk. It's an option. Anyways, I hope that this has been an insightful view to the new Grim2 lists available and if he's a caster that you're looking at getting into, I hope this helps broach your options. The Hunter's Grim is a very adaptable, capable caster unit that can play nearly any style of game. The tools are all there, and Grim2 himself can contribute every turn. It's a fun game and keeps things interesting. Hopefully find out for yourself. This is an absolutely EXCELLENT article. Would you mind if I reblogged it (with proper credit given)? Sorry, didn't see this til today. Yeah, you're welcome to, but the information will be defunct here in 2.5 months. You forgot a key model: the War Wagon. He has a 'direct-hit' knockdown AOE 5 which is incredibly useful for assassinations and he benefits very well from Grim2's feat as well as the Knot. I think a lot of people are feeling that Grim2's star is rising and I must say they are entirely right: he has ALL the tools he needs now (thanks to the Knot) to be a very good caster. I dislike the War wagon immensely. There was no forgetting lol. With the Dhunia knot out, the stock in it goes up, and I was willing to playtest it again, but I'm still not convinced that it's any good. At 9pts I'd rather have a bomber, or even dozer and smigg. However, all that could change now.